Nokio Creek culvert blowout - Flathead NF photo. 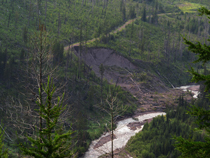 Below is the press release with links to the Notice of Intent to File Suit and Keith Hammer's "Roads to Ruin" report providing photos and background on the failure of the Flathead NF to adequately inspect and maintain its logging roads and culverts. Click here for the resulting KAJ-TV coverage using photos like the one above. Click here for the resulting Daily Inter Lake news article by Patrick Reilly. Click here to read our rebuttal to the Flathead Forest Supervisor's claim that there are no "impaired" watersheds on his Forest due to proactive management. Click here for the resulting Missoulian news article by Perry Backus. Kalispell, MT – Yesterday three conservation groups warned the Forest Service of their intent to file suit under the Endangered Species Act in order to protect threatened bull trout and its critical habitat. The Forest Service’s inadequate management and monitoring of logging roads on the Flathead National Forest in northwest Montana threatens to degrade bull trout streams by increasing the risk of culvert failure, leading to road washouts that smother streams in road sediment, destroy fish eggs and prevent young fish from growing. The notice letter outlines the Forest Service’s failure to comply with numerous biological opinions written by the Fish and Wildlife Service during the past fifteen years. These biological opinions directed the Forest Service to remove stream-aligned culverts from closed logging roads—or, alternatively, to monitor them annually to insure they do not plug. Plugged culverts are prone to fail over time due to accumulation of dirt and debris in the small openings. 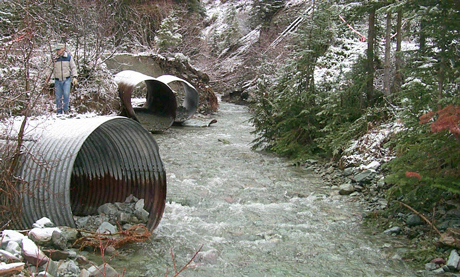 A plugged culvert is likely to blow out during a rain or snowmelt event, depositing sediment into bull trout streams. Though the Forest Service has largely failed to follow either of the Fish and Wildlife Service directives, records show it is aware that far more culverts are failing or are at high risk of failing than initially thought, and that failing roads and culverts put the bull trout and its habitat in peril. In addition to its history of inadequate road management, the Forest Service proposed to relax culvert monitoring from annual monitoring to monitoring once every six years. Best science and a history of culvert failures on the Flathead and other national forests do not support such a move: culverts can plug and blow out in a single season if not inspected and cleaned. The notice letter cites to agency documents showing that agency assumptions that only 10-15% of culverts were at high risk of failing were replaced with findings of 35-40% and as high as 67% of culverts at high risk of failing. Notice, page 14. The letter also cites to documents acknowledging 22 culverts had failed on the roads that had been inspected and that more failures were expected. Notice at 12-13.